By Yasmin Damshenas, Center for Primary Research and Training Just about anyone who has been part of a third-grade class, a soccer team, or a debate club remembers the drill. Everyone lines up by height, gets herded into rows, balances precariously on risers or squats low—all to produce the sort of group photo that sometimes ends up in the archives. In 1843 Austrian Joseph Puchberger became one of the first people to figure out how to make a panoramic camera work. While much of the resulting technology was focused on vistas and landscapes, reproducing the feeling of "being there," another use emerged: the panoramic group photograph; the cinemascope of group photos. To cover the most sweeping degree of vision, the rotating panoramic camera was developed, allowing the camera to pan across an image, take a timed exposure and record a larger field. 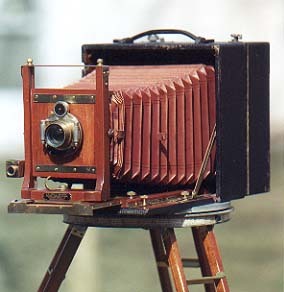 One of the first rotating panoramic cameras was the hand-cranked Cirkut camera. I recently unrolled a Cirkut photograph about 32" long while processing the John W. Fisher Papers. 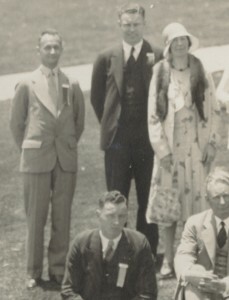 It was a group photograph of attendees of the 25th Annual Convention of California Building - Loan League, taken in the spring of 1930 at the Hotel del Coronado near San Diego. In the sea of three-piece suits and cloche hats, we noticed something odd. 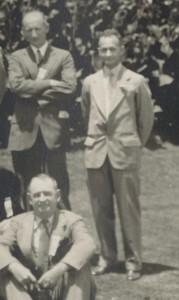 The men standing at either end of the photograph looked strikingly similar. These were either twins who liked dressing alike after the age of 8 or some other explanation was at play... After some discussion and Googling (and making up some elaborate stories along the way), we concluded that this Cirkut photo is an excellent example of the photographer's trick now known as the "pizza run." As the camera panned from one end of the group to the other, anyone standing at the far end where the photograph began being taken could (if their timing was right) run and take their place on the opposite side just as the camera completed panning. A recreation of the process by staff at the Library of Congress can be found here, should you ever want to plan a pizza run of your own.